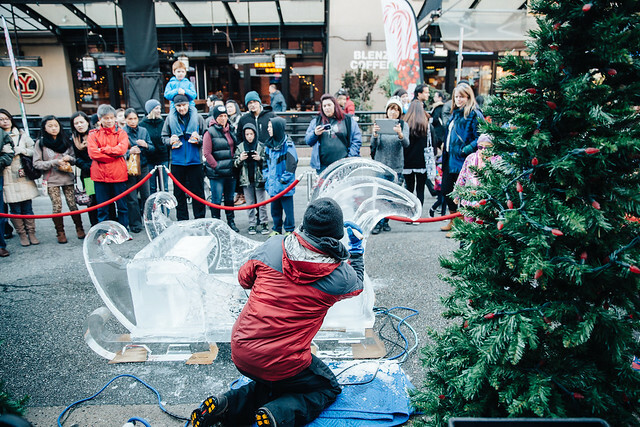 CandyTown returns for its seventh edition in Downtown Vancouver, transforming the heritage district of Yaletown into a winter wonderland on Saturday, November 24, from noon to 7 pm. 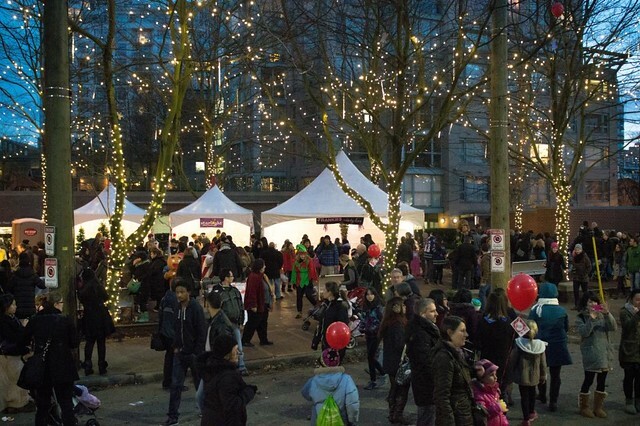 The neighbourhood-wide celebration will host merchants through the Yaletown Business Improvement Association, featuring food, gifts, music and other local vendors along Mainland, Hamilton and Davie Streets. With over 15,000 attendees last year, the 2018 lineup of activities and sugar-packed fun is sure to bring in even more revellers. New for 2018, CandyTown will expand onto Hamilton and Davie streets. Adults will have their own set of attractions to choose from on Hamilton Street: dance the day away at an interactive public disco decked out with a glitter station, take a stroll through a life-sized inflatable igloo or enjoy live ice sculpture demonstrations. With Christmas crafts and gifts, a life-sized Santa sleigh ice carving, dancing gingerbreads, specialty cocktails, live music, roving musicians and costumed characters, CandyTown is an event to ignite the festive spirits of even the most stubborn of Scrooges. Kids can create their own candy kebobs at the Candy Hut or visit jolly old Saint Nicholas and the Ice Queen while sports fans visit the Vancouver Whitecaps ‘Caps Cruiser’, with friendly soccer matches and opportunities to win prizes with one of the city’s favourite mascots, Spike. Embark on a magical horse-drawn carriage ride outside the Roundhouse Community Centre Turntable, making your way along Pacific Boulevard, Hamilton and Davie streets (suggested $2 donation to the B.C. Children’s Hospital to help spur on the horses). Get your holiday shopping started at All I Want for Christmas Gift Market, complete with unique artisanal goods ranging from clothing and home décor to pet accessories, jewellery and flora. Neighbourhood vendors including Skoah, The Hive Printing, SweetLegs, Standout Boutique and Divine Vines will all have their latest collections on display. Environment enthusiasts can check out Vancouver Aquarium’s AquaZone Program and Science World’s ‘Science on the Spot’ stations. Also on-site will be Aunt Leah’s Christmas Tree Lot pop-up. 19+ guests can eat, drink and be merry with a self-guided CandyTown Cocktail Tour, kicking off at Vietnamese hot spot House Special. And hearty appetites can flock to a diverse array of food trucks to satisfy every craving, including Gary’s Kettle Corn, Sable Shortbread, Cannoli King, Damien’s Belgian Waffles, Sweet Thea Bakery and more. The excitement continues onto Davie Street, with an extension of artisan vendors and gift tents. Guests may also enjoy visits to Engine 374 – Canada’s most historic steam locomotive – decked out in twinkling Christmas lights for the holiday season. Attendees are encouraged to bring cash for donations to benefit BC Children’s Hospital, Starlight Children’s Foundation and the Rotary Club. Donations will be accepted for horse-drawn carriage rides and visits with both Santa and the Ice Queen.